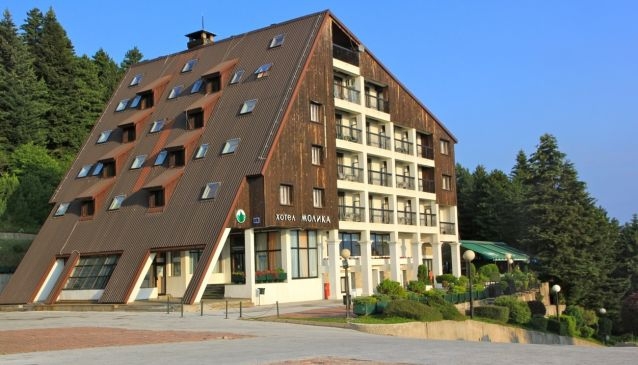 Hotel Molika is a modern hotel with elegant design and beautiful sights that surround it. It has 54 rooms with one, two and 3 three bedrooms and also 3 apartments. The rooms are separated on 4 levels, half with a view of the green mountain and the other half with picturesque view of beautiful valleys and fields. Each room is equipped with TV, mini bar, central heating and private bathroom. The hotel is also provided with an elevator for an easy access to all rooms and other facilities. The real challenge for the guest is the stunning surrounding as it offers unique panoramic views as well as recreations in every part of the year. Enjoy the comfort of the Hotel Molika and its beautiful environment with green forests and fresh healthy air.